A federal judge Tuesday ordered the release of an undocumented immigrant, who was detained while delivering pizza to a New York military base. 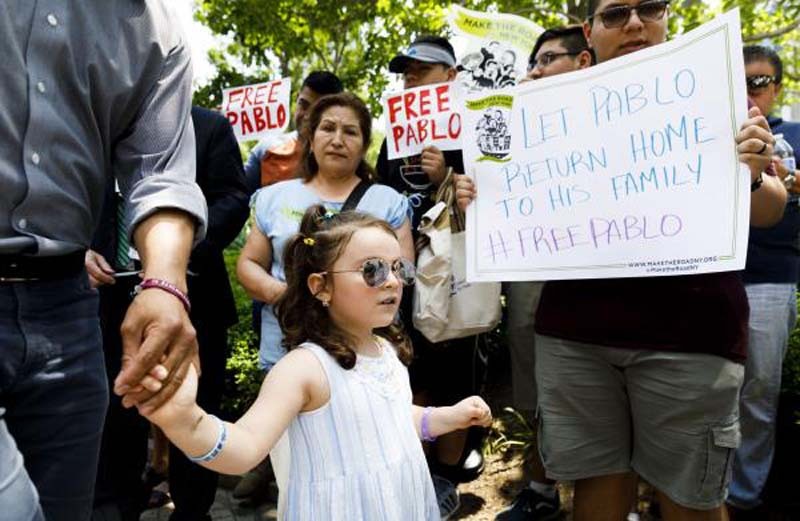 U.S. District Judge Paul Crotty issued an order calling for the immediate release of 35-year-old Ecuadorian native Pablo Villavicencio, 35, and ordered a stay of his deportation as he attempts to gain citizenship after nearly two months in an immigration detention facility. In his ruling, Crotty wrote that Villavicencio must be released immediately from custody because his removal from the country was "no longer reasonably foreseeable" and he has "been a model citizen." [post_ads]"The rule of law, humanity and morality prevailed tonight with the Court's order releasing Pablo back to his family and community," Adriene Holder, attorney-in-charge of civil practice at The Legal Aid Society, which represented Villavicencio said. "This decision should serve as a rebuke against the Trump Administration and its merciless crusade to tear families apart." Villavicencio was turned over to Immigration and Customs Enforcement agents while delivering pizza to the U.S. Army Garrison Fort Hamilton from a restaurant in Queens, when a background check revealed he had an open order of removal since 2010 and he was immediately detained. Villavicencio's wife, Sandra Chica, said he filed for his green card in February and was awaiting a response when he was detained. She is a U.S. citizen and the couple have two young daughters who were born in the United States. New York Gov. Andrew Cuomo condemned the decision to detain Villavicencio. "Mr. Villavicencio was held for 53 days, and that is 53 days too long -- this never should have happened," Cuomo said. "While the federal government continues its un-American assault on immigrants, New York will stand with our immigrant communities and strive to uphold the values embodied by the (Statue of Liberty)."